Give back and have an impact. St. John's is Catholic, Vincentian, and Metropolitan, committed to excellence and the purpose of wisdom which flows from free inquiry, religious values and human experience. We strive to provide excellent education for all people, especially those lacking economic, physical, or social advantages. 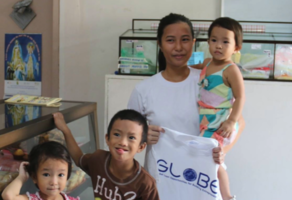 Join us in the fight against poverty by donating to GLOBE and raising the voices of women around the world! 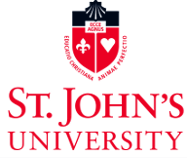 Help St. John's Women's Volleyball raise funds to attend a preseason tournament. 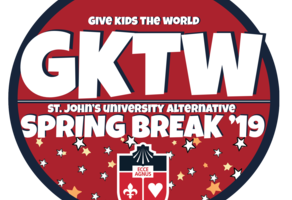 Support your fellow Johnnies in continuing this 12 year service tradition at Give Kids the World, answering the call to what must be done. 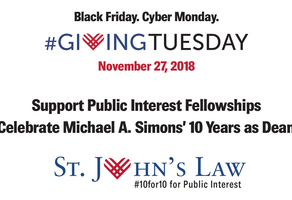 On November 27, celebrate Giving Tuesday by giving back to St. John's University. Be a voice of #GenerationGLOBE, and help us to reach our goal of $2500! Join us in our quest to be the change we want to see in the world! Please help us celebrate our 30th anniversary with a gift to the Phyllis Bell Scholarship Fund. Every gift makes a difference. Support the 2019 Ron Brown Prep Program! Support the 2019 @RonBrownCenter Pipeline Prep Program to increase #diversity in the legal profession! 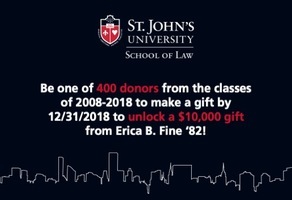 Be one of 400 graduates from the classes of 2008-2018 to donate by 12/31/2018 to unlock a $10,000 match! Make an impact at St. John's! Connect with other Johnnies on GiveCampus!